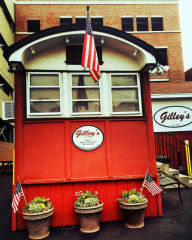 The Gilley's Lunch cart was built in 1940 by the Worcester Diner Co. of Worcester, MA. This diner is one, of just five that were built, and is the only one remaining in full operation today. This diner, and its predecessor, were hauled into Market Square each evening and parked in front of the North Church in preparation for the evening's business. Originally the diner was towed by horse, then tractor and finally by truck. The mural behind Gilley's, recently painted by John Perry, depicts Gilley's in the 1900's in Market Square. Gilley's was moved to its present Fleet Street location in June 1974. Although permanently situated, Gilley's retains the same characteristics and authenticity as when it was mobile. The truck that towed the diner is still attached to the front of the structure and the wheels remain under the skirting. The interior contains the original oak, porcelain trim and fixtures. Every effort is made to retain the original charm and character of this historic diner. Gilley's is named after longtime employee Ralph "Gilley" Gilbert. Gilley served dogs and burgers from the diner's tiny kitchen for over five decades. An icon in Portsmouth history, Gilley was known for his flawless memory, kindness, and generosity. He greeted his customers by name, had a good word for everyone, and never let the lack of funds prevent a hungry customer from eating. Gilley died in 1986 but his name and fame continues. The wing added to Gilley's in May 1996 combined the diner with its former separate storage trailer. The additional storage and refrigeration facilities enabled Gilley's to expand its menu, improve safety, security, and provide better service to you, our customer.